Let’s get this out of the way first: It’s wooder ice. Rita’s was founded on May 4, 1984, a wonderful time before anyone made “May the 4th be with you” jokes. It started in the Andalusia section of Bensalem on the side of a house on Bristol Pike (Route 13), right across from the Woodhaven Mall. The mall is now a shopping center; Rita’s now has over 600 locations. Wednesday’s celebration was half-publicity stunt, half-company gathering — close to 100 people arrived by noon at the original Andalusia location. And, as such, a bunch of politicians or their representatives made appearances at the event: Bensalem mayor Joseph DiGirolamo, representatives for both Pennsylvania Senators — Pat Toomey and Bob Casey each sent their regrets —representatives for state senator Tommy Tomlinson and state rep Gene DiGirolamo (The DiGirolamo Family: The Bushes of Bensalem) as well as a few Bensalem council members. 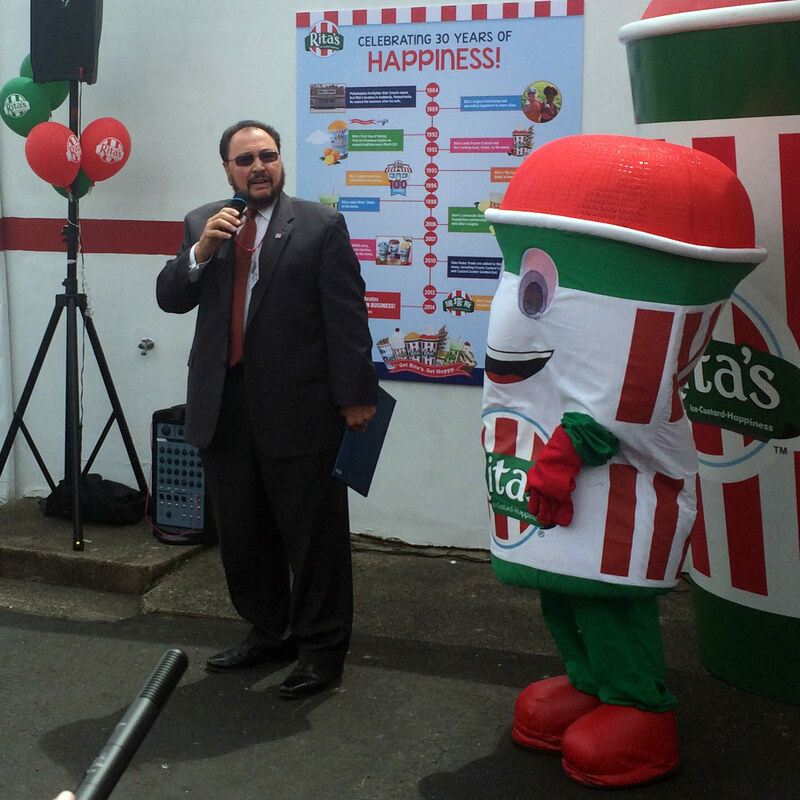 Rita’s — which began franchising in 1989 and was first sold to a private equity firm in 2005, before being flipped to Falconhead Capital in 2011 — even sent company president and CEO Jeff Moody to the tiny Bensalem parking lot. 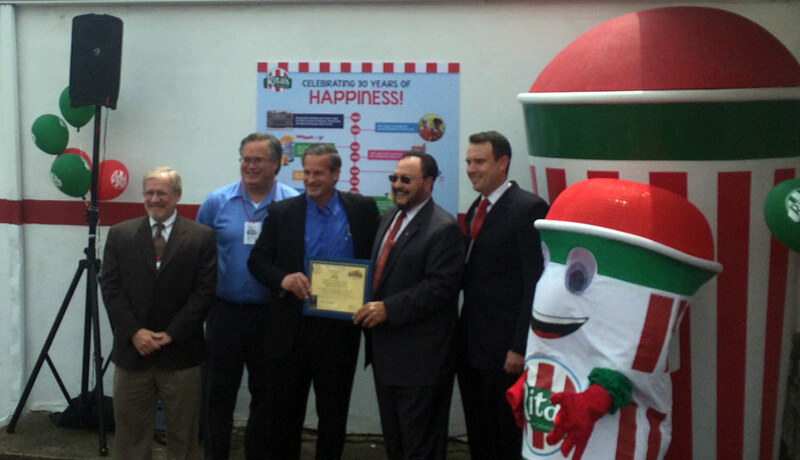 In an awesome moment, Bensalem’s mayor then had to pose with Moody, other politicians and Rita’s Ice Guy mascot. Included in attendance were 30 people in line for free stuff. The first 30 customers got a Rita’s prize pack and got to have their ice cream scooped by, um, the mayor. The Rita’s press release was very clear on the rules: “First 30 Guests in line must stay in line until 12:30 p.m. or when local celebrities-dignitaries scoop Rita’s Wild Berry Italian Ice.” There was no debauchery at this party, though. It couldn’t have been more orderly. 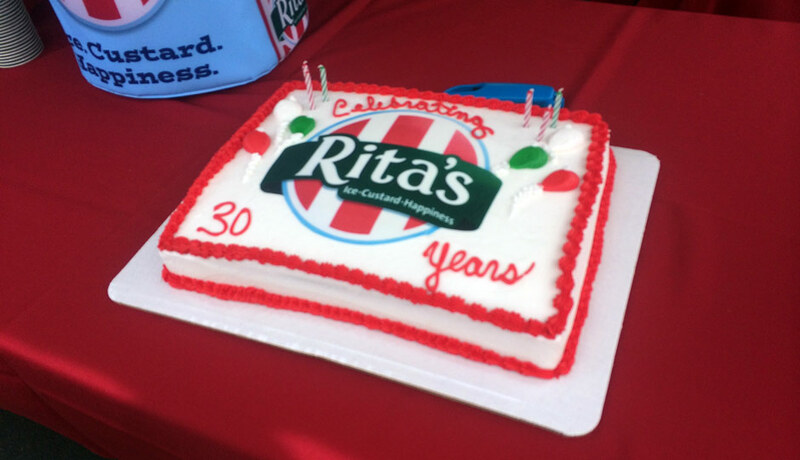 Those 30 guests got a piece of cake, some Wild Berry water ice and a Rita’s prize pack. Most of those in line were little kids; it was adorable. I also learned a lot of interesting things about Rita’s! The best-selling flavor is mango. Also in the top 5? Swedish Fish. In 1987, Rita’s had three locations. They began franchising in 1989, and had 100 stores by 1996. Rita’s had 322 stores when McKnight Capital Partners bought it in 2005, and now has more than 600. Last year, Rita’s opened its first store in California. You’re welcome, hippies! 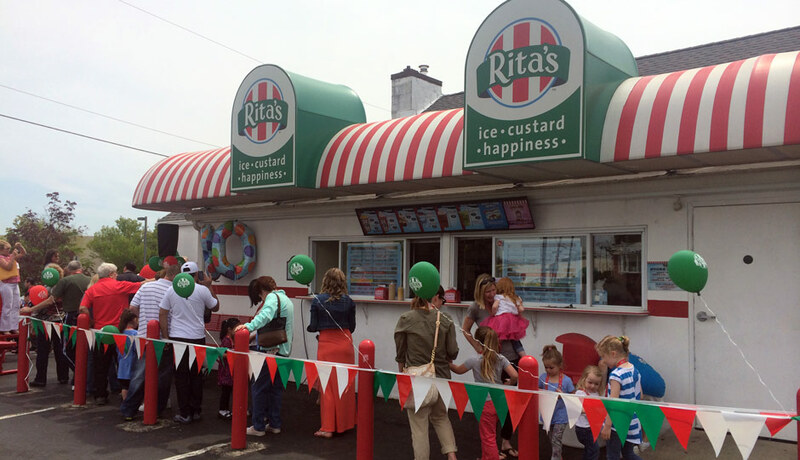 Rita’s has been giving away free water ice on the first day of Spring since 1992. Rita’s has international locations in Canada and China. The company has raised “millions of dollars over the years” for Alex’s Lemonade Stand. Neat! It may not have the local cachet as Wawa, but Rita’s holds a special place in the heart of many Philadelphians. When I was a kid, we’d go to the Rita’s after tee ball at Liberty Bell. The line seemed to stretch on forever, but no one was leaving. When I got older, we’d usually get water ice and chill in Academy Plaza parking lot. As a kid, Rita’s was a luxury treat. “You get fruit at the bottom! This must be the type of water ice kings eat!” On the first day of spring in high school, the distance runners on the Holy Ghost track team would map out our long runs so they’d end at the Andalusia location, then walk the mile back to school eating water ice and goofing around. None of these are particularly earth-shattering memories, but a lot of people in the area have similar stories. Rita’s is owned by a private equity firm — but it still has that Philadelphia feel for me, and a lot of people here. Rita’s is an important part of the Philadelphia phood pantheon.